Seating just got more supportive with the Steelcase Leap Chair with 3D Knit Mesh Back, delivering better ergonomics with a single seat switch. Enjoy a more comfy seating situation with a dynamic look and better optimal airflow with the Leap Chair with 3D Mesh Back by Steelcase. Years of research led their designers to create an all-inclusive chair for a wide variety of body types that's more lightweight than previous Leap Chairs. Upgrade your chair and improve your work life, one seat at a time. With its unique mesh back, you'll get the same ergonomic support you're used to getting with the Leap Chair, but with better breathability to your back, making this an ideal chair for use in humid or hot environments. Steelcase Leap Chairs with 3D Knit Mesh Back are designed to seat the widest possible range of people comfortably, making this an easy solution to subpar seating everywhere. Unlike some mesh chairs, 3D Knit mesh is soft to the touch and will not abrade your clothing. It is available in a wide variety of colors. 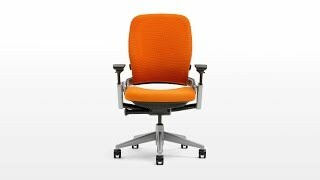 The Steelcase Leap Chair is available with a standard (seat height: 15.5'' - 20.5'') or tall (seat height: 17'' - 24'') cylinder. $1,016.00 List Price: $1,613.00* The list price is the same as the MSRP (Manufacturer's Suggested Retail Price). It may not necessarily be the price at which the product is sold.